Performing bulk actions on your Quote record can help save time when trying to edit multiple products in one go. A useful example of when you may wish to use the Bulk Action Tool is to reset pricing & discounts on the Quote lines because the Quote has now expired. To perform bulk actions on your Quote record click on the additional options menu & choose the 'Perform Bulk Action' option. Using the Bulk Actions tool you can then choose which Quote lines you wish to update, either by selecting a few or by choosing to select all. Once you're happy with your selection click 'Choose Action'. You will then be presented with various Bulk Actions that you may wish to perform. This article will focus on the Bulk Actions which are specially for updating Quote lines such as Set Margin, Set Markup & Reset Pricing & Discounts. By selecting the Set Margin Bulk Action you will be able to enter a new margin percentage for the Quote lines selected. 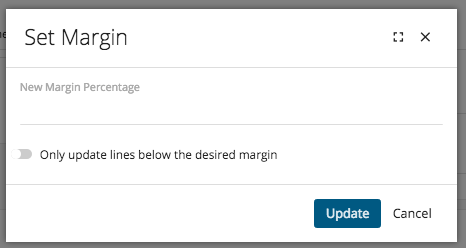 You have an additional option to only update lines that are below the desired margin so higher margins are not effected. Once happy with your selection click update & all selected Quote lines will be amended accordingly. By Selecting the Set Markup Bulk Action you will be able to enter a new markup percentage for the Quote lines selected. You have an additional option to only update lines below the desired markup, to ensure higher markups are not effected. Once happy with your markup percentage click update. Resetting pricing & discounts can be very helpful if the Quote has expired which may result in outdated prices & discounts. By choosing to reset prices & discounts the selected Quote lines' prices will be updated to reflect current prices & discounts featured within your accounting system. To reset prices & discounts click the 'Reset Pricing & Discounts' option & then click the 'Confirm' button. For more information on bulk actions take a look at our Performing Bulk Updates article.